Evar have one of those mornings? Happened to mom yesterday. We were all snuggled in bed. She mumbled something about when the alarm was going to go off. She turned on the light on the clock and said a bad werd. She was 30 minutes late. She jumped out of bed, ran out and then opened the bathroom door. And momma cat decided to make a run for it. Down the hall.....into the living room.....under an end table. Really??? Mom grabbed her, got everyone fed and managed to get out of the house. We all ducked to make sure our tails didn't get stepped on. Breaking new: the babies are (sorta) using the litter box!!! Mom has caught them a couple of times. However, she thinks it is funny that kittens are kinda like teenage girls - they all seem to have to go to the bathroom together. There were two in there at the same time this morning. Luke and Duke came back home with mom last night. They have Duke on an antibiotic though they don't seem to know what is going on with them. Duke was acting normal and ate dinner with everyone last night and this morning. Luke was acting lethargic last night but was out this morning though moving slowly. So, whatever it is, Duke seems better and Luke seems to have it now. Duke was a little crabby when mom got to the shelter last night, but was MUCH better when she went back to pack them up to bring them home. And he has been chatty with her here at the house. Hopefully his attitude at the shelter was related to him not feeling good. We certainly hope your mom has a better day today, and that you all have a great weekend. Continued purrs for everyone to be healthy and happy (and of course to find perfect forever homes, in due course). I am glad to hear that Duke is some better. Such cuties! We are all purring for dear Squashies. Wow that little mom and her babies are drop dead gorgeous!!!! Baby calicos are so freakin cute!! I hope you have a good long restful weekend covered with happy purring healthy kitties..
Glad at least that Duke is better. Silly Mom cat running for it. Those kittens are too darn cute. Tell Mom that we will be sure to give MewMew a dry bed when it rains. It stays pretty dry in that little house. Take care and have a good week end. I think you all need to snuggle up together and relax this weekend! Nothing like a little exercise to start the day. LOL! We'll be purring that Luke and Duke feel better now that they are "home". The bathroom mum and kitties are just adorable!! What a Friday you've all had! Purrs for Luke and Duke!! We had a bad Thursday too. I'm very smitten with the little calico girl! Those itty bitties are sooooo cute!! LOL @ kittens going to the bathroom together. Sending purrs to Luke and Duke. Be sure to come by my blog to read about the Cats in Boxes photo contest, and enter to win free cat food and treats! YUM! aaaahahahahaaa about the teen gurls! Allie's like that, or least she WOULD be if we had another girlcat. So she goes wif MOM instead! Oh yes... we heard the bad news about Squashies, too...our hearts ache for them. We're kinda glad to hear you have no plans for the weekend. You all can chill out and enjoy! Have a great one!! Squee...kittens and thanks for posting about Squashies. It's always the morning when you think you've woken before the alarm when you find out you haven't...and that would also be the morning the cats don't bug you to get and feed them "on time". Love the baby photos (and mom too - she's so pretty), and glad to hear Duke is doing better. Hope Luke gets over it soon. 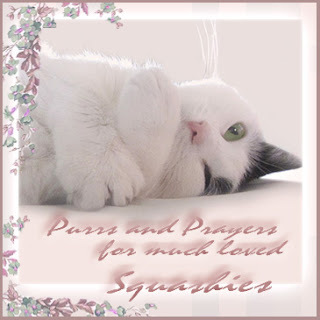 Lots of purrs coming from here for Squashie and her family.